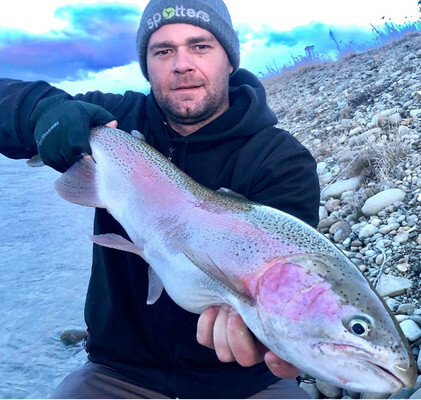 RAINBOW CONNECTION: Michael Evans with a big trout in New Zeland. Corio Bay’s inner-harbour and waterfront area hosted good salmon fishing again over the past week. Casting flick-bait soft plastics or metal lures snagged fish up to 1.5kg. Pinkies, snotty trevalla and flathead were also present and responding well to soft plastics, chicken and bluebait. Anglers seeking big winter snapper from the comfort of a car seat should try St Helens boat ramp or even along the waterfront. Over the past few years anglers fishing after dark with pilchard baits have caught them in mid-August. Rumours of big fish appearing on sounders were frequent this week too, so we expect to see some caught in close very soon. The Bellarine Peninsula was a great area to target squid. Trelly’s Geelong’s Chris and Perry headed out after dark midweek, having no dramas snagging a number of squid between Portarlington and Queenscliff on white Odori and Yamashita jigs in size three. Water of 20m directly east of St Leonards’ boat ramp produced big qummys. Fishing a tide change with fresh squid or salmon produced best results, with the south channel always worth a visit too. Fantastic salmon fishing continued along the coast for anglers casting heavier metal lures into the surf. Bancoora was a hot spot and not too far from home, while beaches and rock platforms from Jan Juc to Lorne also produced fish to 2kg. This weekend’s forecast promises the best conditions for over a month, finally allowing anglers to head off shore locally for a bottom bash. Straight out from Barwon Heads in 30m to 50m should see big pinkies and snapper in good numbers, along with gummy sharks. On freshwater, Lake Bolac remained the hot spot, with rainbow trout to over 3kg responding well to Powerbait fished from the bank. Further afield, local legends Trevor Holmes and Michael Evans, from Victorian Inland Charter,s hit the skies and headed to the south island of New Zealand where they fished the canals. The pair hooked into monster brown and rainbow trout, catching over 60 fish in three days, including a trophy buck of 26lb.